Blue Mountain Ski Resort, the largest mountain resort in Ontario, Canada. Perfect for your snowboarding and skiing holidays. Located near Collingwood. Horseshoe Resort can offer you that genuine experience that will remind you what getting out on those slopes is all about. Ski Snow Valley Barrie features skiing, snowboarding and Ontario’s best snow tubing. Snow Valley was named "best Ontario hill for kids" by Ski Canada Magazine in 2001. Over 20 km's of Nordic Skiing trails, varying from the groomed Meadowlands Trail, to the ungroomed,snowshoe only Hardwood Trails. 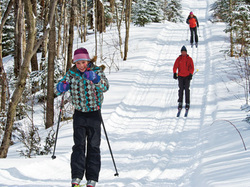 With 16 kilometers of groomed trails, cross country skiing, snowshoeing and sleigh rides are some of the recreation activities available throughout the winter season. Ski Ontario - Ski Ontario provides a directory of Ontario ski / snowboarding hills and xcountry ski areas. Ontario ski and snowboarding information and ski resorts. Ski Canada - SkiCanada.biz provides a directory of Canada ski / snowboarding hills and xcountry ski areas. Canada ski and snowboarding information and ski resorts.